BEFORE THE EUROPEANS ARRIVED, Cuba was inhabited by three different cultures: the Ciboneyes, the Guanahatabeyes and the Taínos. The Guanahatabeyes were in the island the longest, and have been described as a "shell" culture, or as nomadic societies of hunters and gatherers who used natural materials, such as unpolished stones, seashells and fish bones, for tools. Because their few artifacts display certain similarities of early inhabitants of Florida, it is speculated that they came from the south of the United States. Diego Velázquez, Cuba's conqueror and first Spanish governor, was openly shocked by the lifestyle of the Guanahatabeyes. "They're savages!" he said, "without houses or towns and eating only the meat they are able to find in the forests as well as turtles and fish." The other two cultures, the Ciboneyes and the Taínos, were part of the larger South American Arawak group, believed to have island-hopped through the West Indies. 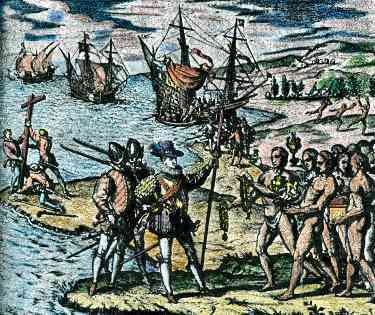 It is speculated that Taíno tribes were forced westward, some two-hundred years before the Spanish arrival, by a bloodthirsty tribe known as Caribs (this is where the word cannibal came from). They would raid a village, kill all of the adult men and consume their flesh. The women were spared for slavery, as were the young men, who were castrated. In Cuba, the Taínos found a paradise openly available and very suitable for their peaceful lifestyle. The Ciboneyes eventually became servants of the Taínos, who were more evolved and technologically advanced. Typical Taíno societies performed the traditional activities of fishermen and hunters, and introduced agriculture to the island. Their staples included maize (corn), beans, squash, peanuts, yucca, and tobacco. They created a variety of tools and artifacts by polishing stones and carving wood, and they were accomplished potters, crafting a variety of utilitarian pieces and small figurines of animal and human forms, male and female, which represented spirits considered sacred by each community. The Taínos also made houses, called bohíos, out of cane or bamboo, and formed villages, which were ruled by caciques or behiques, whose functions comprised those of priests, doctors, and chiefs. They also cultivated cotton, using it to weave fishing nets and sleeping hammocks. Tobacco was used for religious, medicinal, and ceremonial purposes. Taino men wore no clothes, but the women wore skimpy cotton aprons that covered them in front from the waist down to their knees, and both sexes appear to have enjoyed equal status in their society. It is speculated that they were both very sexually promiscuous, and we know for a fact that both sexes were fond of painting their bodies in bright colors, and wearing jewelry made from shiny stones, feathers and shells. "The indians that Columbus and his men encountered in Cuba were a simple and happy people living in a peaceful and gentle world," writes Jorge Guillermo in his book, Cuba: Five-Hundred Years of Images. "They had no enemies, human or otherwise, and were therefore unused to combat. Their pathetic inability to resist the Spanish invaders made their eventual submission in the hands of the conquistadores an inevitability." By the mid-sixteenth century, Cuba's indigenous population had dropped to less than a few thousand as a result of disease, mass suicides and Spanish exploitation.